The Select Case structure is a useful VBA structure for decisions involving three or more options in Excel 2016 (although it also works with two options, providing an alternative to the If-Then-Else structure). In this example, the Quantity variable is being evaluated. The routine checks for four different cases (0–24, 25–49, 50–74, and 75 or greater). When VBA executes a Select Case structure, the structure is exited as soon as VBA finds a true case and executes the statements for that case. Find out whether the cell is empty. If it’s not empty, see whether it contains a formula. 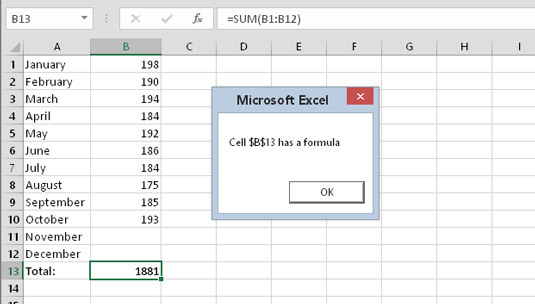 If there’s no formula, find out whether it contains a numeric value or text. When the routine ends, the Msg variable contains a string that describes the cell’s contents. The MsgBox function displays that message. A message displayed by the CheckCell procedure. You can nest Select Case structures as deeply as you need to, but make sure that each Select Case statement has a corresponding End Select statement.